Lynnwood Grill’s catering service in Raleigh, NC and beyond is the perfect choice for your next event! Whether at business meetings, parties or sports events, our food is always a crowd-pleaser. With our pastas, specialty pizzas, salads, appetizers and more, there’s something for everyone. We take extra care to make sure our ingredients are fresh, often using organic produce, so there’s no question about the quality of our food. If you’ve been to our bar and grill on Grove Barton Road before, you know just how enjoyable our menu items are, so why not share with your friends or coworkers? 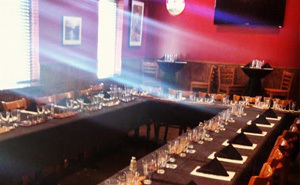 Our Grove Barton Shopping Center location features a private banquet room in Raleigh, seating 50-60 guests. If you decide to reserve our banquet room for your next event, we’ll meet all of your catering needs by offering a wide menu selection, as well as our full bar and house-brewed craft beer. If you have questions concerning our Raleigh catering services or our private banquet room, contact our catering manager directly for more details. At Lynnwood Grill, we love getting to know our surrounding community, so come by anytime for a meal or to try our house-brewed craft beer. 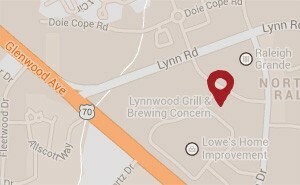 Lynnwood Grill & Brewing Concern offers our catering services and private banquet room to our customers in Raleigh, NC, including the Lynn Road, Glenwood Avenue and Hilburn Drive areas.